Keratin + Silk Intensive Repair Hair Mask provides thorough hair repair, inside and outside the hair. The unique feature of the mask is wax consistency and formula rich in nutrients. What is the action of Biovax Keratin and Silk mask? Most of all, it improves hair condition, deeply regenerates, moisturises, nourishes and protects hair from moisture loss. L’biotica offers complex care. The ingredients are very interesting and valuable thus I would like to devote some time to describing them. I wouldn’t like to omit any important information about the components of L’biotica Biovax Keratin + Silk. 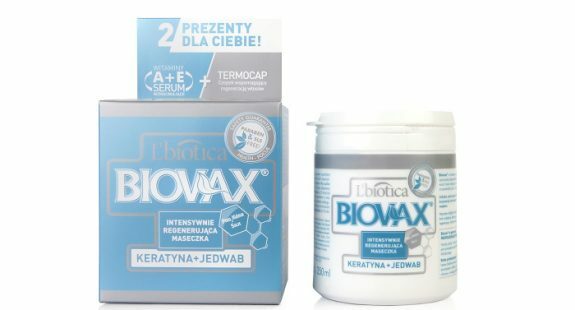 The formula contains mainly three ingredients that are characteristic of Biovax masks: sweet almond oil which strongly moisturises, softens and nourishes; lanoline and glycerol – two delicate emollients which maintain proper hydration in hair; henna extract which largely enhances the penetration of nutrients. Biovax Keratin and Silk hair mask has been enriched with active complex of natural proteins – Pro2Kera Silk. It is simply the combination of low molecular weight amino acids and high molecular weight proteins and natural building blocks of hair. Silk amino acids repair hair damage; silk proteins protect hair inside and lock in the moisture; natural keratin replenishes the deficit of the building block of hair. I really like this emollient-protein composition. Proper proportion of ingredients in Biovax mask means that there is no need to worry about getting overproteined hair whereas the effectiveness is guaranteed. Sadly, the product also contains a silicone which can only be washed away with SLES (strong detergent). However, stay come. It is a harmless ingredient. This is my favourite among all Biovax hair masks but it isn’t on the podium. It is because of the silicone included; also the product isn’t very efficient and the fragrance isn’t nice. In my opinion, L’biotica Biovax Keratin + Silk hair mask has too strong scent but it is probably the matter of taste. It is much worse than in other masks of this brand. It is quite sweet and you can smell it on hair even after washing and blow-drying the strands. The mask has a thick buttery consistency. The efficiency of the product is not impressive. In my case, the packaging holds out up to 12 applications. If we consider the low price, it pays off. The largest asset of Biovax Keratin + Silk mask is that it provides a long-lasting effect. This is what makes the product stand out among other cosmetics which usually provide temporary moisture, smoothness and improved condition of hair. I know from my own experience that you should leave on the mask for 30 (up to 40) minutes. You will get the best results if you cover your head with a towel as the heat enhances the absorption of nutritional ingredients. Regular use of Biovax mask makes hair supple, shiny, smooth and moisturised from the roots to the ends. I must warn you – if you apply the mask too often, it may weigh your hair down or make it frizzy, depending on its type.